Little Lakes Machine & Tool of Stratford, Ontario, specializes in custom tooling for powdered metal parts. Most of the materials used in the company’s tools are of the 55 HRc and 65 HRc varieties—work that is not easily accomplished by most shops. The process is used to produce power transmission components, structural shapes and aerospace brackets. The company wanted to improve hard milling accuracy and finishes. It also needed technology to handle small, intricate parts for a new business opportunity. Little Lakes purchased a Makino V33 vertical machining center after Makino’s successful performance with a part that the company had sent out for competitive testing. After it experienced solid results with the V33 on its shop floor, Little Lakes purchased a Makino V22 vertical machining center with an automated cell for 24/7 hard milling of tools for powdered metal part production. The Makino EDNC43S sinker EDM machine was also purchased for an aerospace aluminum application. The success of that machine led to the purchase of an additional EDM machine, the Makino EDAF3S. With the V33, Makino reduced cycle time by 70 percent on the test part. The accuracy and finish were so close to the final spec that EDM procedures and associated electrode production were able to be eliminated. The V22 has provided extended reliability in long run-time hard milling applications, such as on a solar panel tool, where the male side required 21 days of uninterrupted processing. 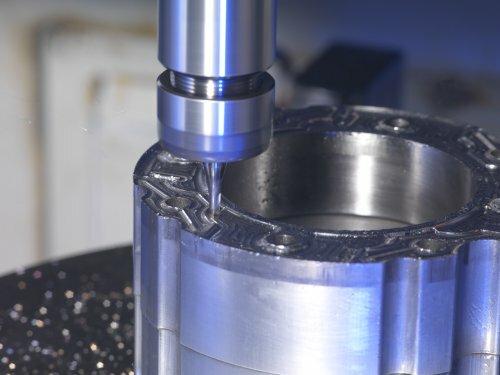 The automation enables setups to be performed offline without interrupting hard milling processes, and operators don’t have to stand at the machines all the time. That means operators can be redeployed to perform more value-added tasks. The machines operate on two shifts during the week and unattended over the weekend. Tolerances of plus or minus 0.0002 inches are achieved with the new vertical machining centers, producing higher quality powdered metal parts. Improved surface finishes have also been achieved with the new EDM technology.